The booklet contains stamps to the value of $14. 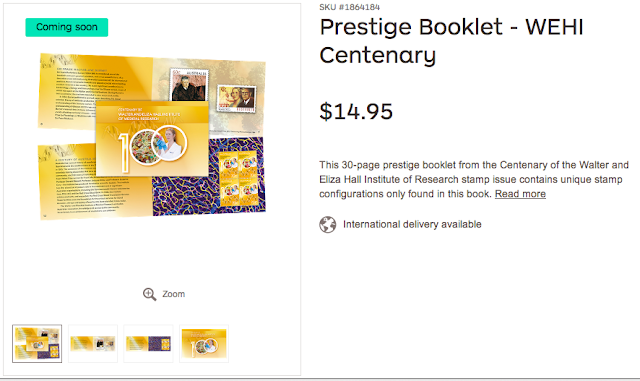 While it makes sense for the booklet to contain five panes each containing a block of four 70c stamps, given the above image, and that many of its scientific leaders (including Nobel laureate Sir Macfarlane Burnet, Sir Gustav Nossal etc.) 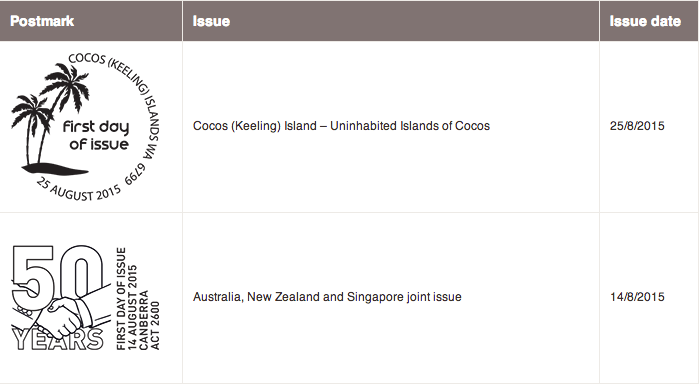 have appeared on stamps before, I wonder if the booklet will include reprinted stamps? 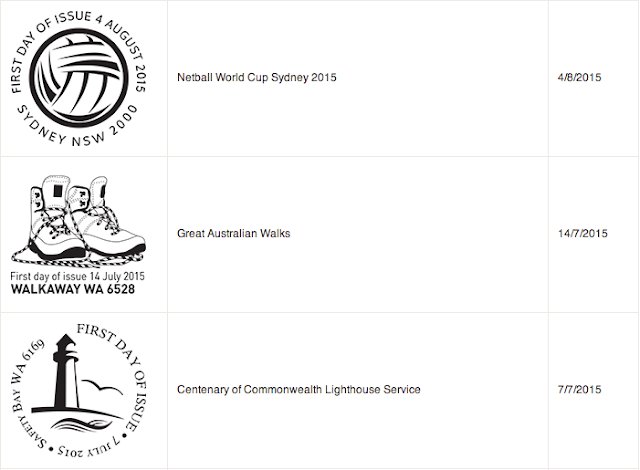 Australia Post's website has been updated to list stamps and first day of issue postmarks due for release in July and August 2015. 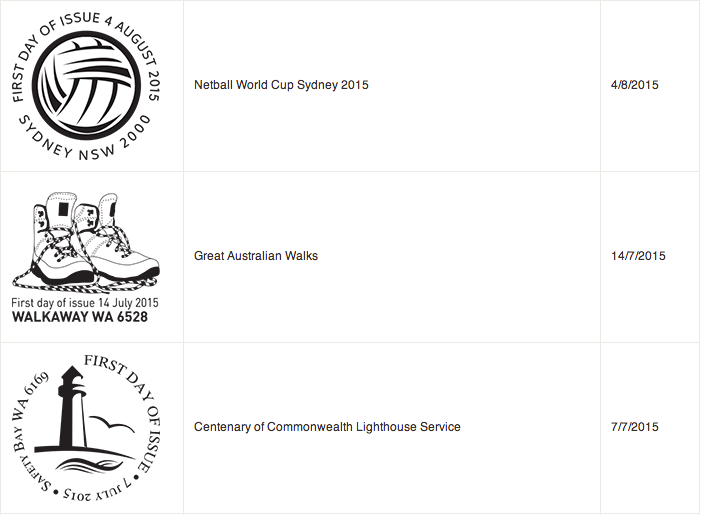 The Lighthouse issue marks the end of series of lighthouse stamps issued by Australia Post over the last 14 years! An interview with the photographer whose photographs are used on all the stamps was broadcast on ABC Radio several months ago. 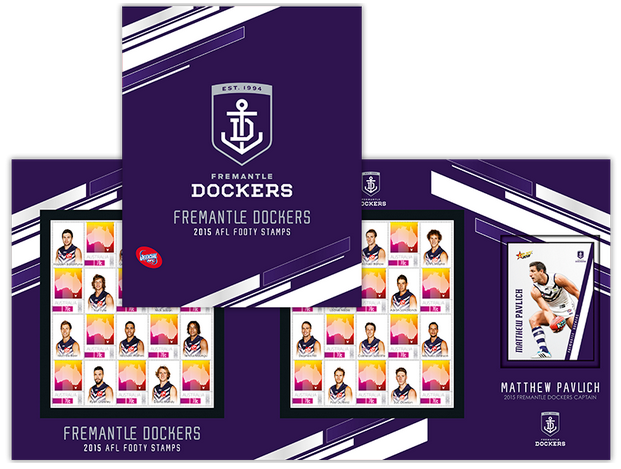 Initially advertised as being released in May, this year's Footy Packs started to trickle into post offices from 15 June. As I write this, Australia Post's website only has the AFL Packs available, and were only available to order online from 18 June. Post offices are receiving packs spasmodically, and it seems only of their state's teams (this is likely to avoid wastage or lack of sales). The packs contain two sheetlets of 10 (face value of $14) and a collectors card often showing the captain. The packs sell for $15.95 each. The sheetlets are printed by RA Printing, who printed the sheetlets last year. The NRL packs have not yet been released. 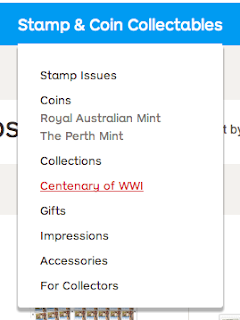 Regular visitors to Australia Post's online shop (http://shop.auspost.com.au/) will have noticed some a colour change to the website, and from today a new section: Centenary of WWI. At the moment the only item listed is the 'Dinkum Oil' pack (released to post offices nearly 2 weeks earlier! ), though more items are expected. Post offices started to receive stocks of 'The Dinkum Oil' pack early last week (the product has an official release date of 2 June, which seems correct). The pack contains two exclusive sheetlets, with the stamps in a different arrangement to the original release. The printer of the sheetlets is not yet known, but will likely be different to the original. Update 1 (11 June 2015): The actual sheetlets do not have perforations through the selvedge, unlike the image below. Scans of the actual sheetlets will be shown soon. Update 2 (12 June 2015): The sheetlets were printed by Ego Print, who printed the original issue. RA Printing printed the 2014 War stamps in the multistamp sheetlets released as part of the Impressions range.